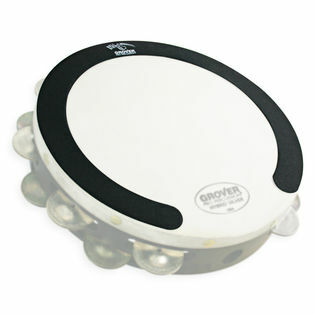 The Roll Ring by Grover Pro Percussion is designed to aid concert percussionists with the execution of thumb/finger tambourine rolls. This circular ring helps players easily create the friction needed to produce a smooth, even sounding roll. The 1″ wide band is specially shaped to conform to the outer edge of a headed concert tambourine. It has a special non-permanent adhesive backing that makes it super easy to put on and take off in just seconds. The Roll Ring is reusable and can be applied and stored numerous times. Whether you're a seasoned professional or an aspiring young percussion student, the innovative new Roll Ring helps you sound your best. I don't spend my practice time perfecting tambourine thumb rolls or getting the perfect amount of bees wax on my tambourine heads. I own 4 tambourines from different manufacturers. This ring roll works very well. Easy to control thumb rolls at various dynamic levels. No thumb licking needed. It works every time and since I have them on all my tambourines there is a consistency of technique. Several of my fellow percussionists have ordered them for their tambourines to make life easier. When it stays on, it works great. My thumb rolls are much more consistent than with beeswax, and it also helps deaden the head noise, which is an added bonus. Unfortunately, it has somewhat of a cone shape rather than being flat, and it will not stay stuck to my tambourine no matter how much I press it down. It starts to come unstuck within minutes of putting it on. I can't even get through a single excerpt before it starts to come unstuck, and of course, if it isn't stuck on, it isn't helping me with my thumb rolls. If I could find an adhesive to fasten it on without damaging the head of my tambourine, I'd use that. This roll ring works great for a dense thumb/finger roll. I like the consistency of the sandpaper more than having the occasional "slick spot" in my beeswax. Also, it dampens the head for more jingle sound. It works well for an educational setting where its use is far more sanitary than having multiple students lick their thumbs before playing thumb rolls. This is a classic idea made convenient.